66 • RV PRO • November 2018 rv-pro.com O R I G I N A L E Q U I P M E N T A driver getting behind the wheel of a sedan, SUV or pickup faces the risk of blind spots and other collision hazards. Those risks multiply exponentially when the driver is piloting a 40-foot diesel pusher. So perhaps it's no surprise that a company that's been pro- viding advanced driver-assistance systems (ADAS) in the auto- mobile and fleet markets for nearly two decades has expanded its reach in the North American motorhome market during the past six years. Offering the company's product to the RV market has been a natural progression for Mobileye, which was founded with a vision of offering vision-safety technology designed to make roads safer, reduce traffic congestion and save lives, according to Steven Wenger, one of the company's business development managers for its New York-based North American operation. 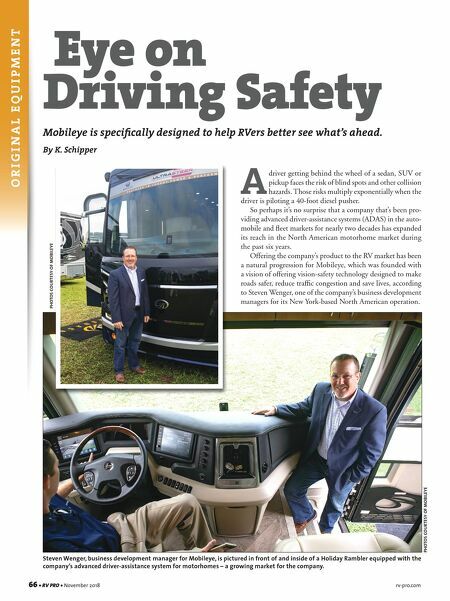 Eye on Driving Safety Mobileye is specifically designed to help RVers better see what's ahead. By K. Schipper PHOTOS COURTESY OF MOBILEYE PHOTOS COURTESY OF MOBILEYE Steven Wenger, business development manager for Mobileye, is pictured in front of and inside of a Holiday Rambler equipped with the company's advanced driver-assistance system for motorhomes – a growing market for the company.